Red Cloud Interactive is proud to present another KPop themed event. 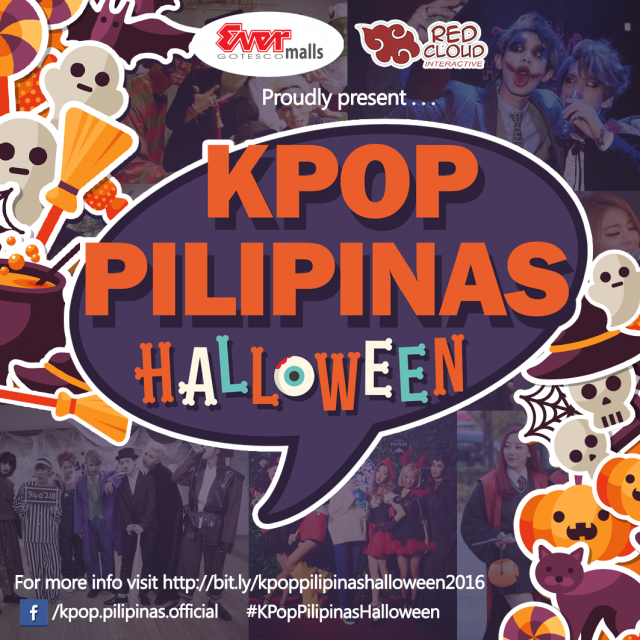 After the success of the first event at Ever Gotesco Commonwealth, we are proud to bring you KPOP PILIPINAS: HALLOWEEN EDITION on October 22, 2016, at Ever Commonwealth, Quezon City. This event includes exhibits, trivia, games, and competitions. Competition includes dance challenge, KPop fashion, KPop cosplay and KPop voice competition. A total of Php9,000 worth of Ever Gift Certificate is in store for all the winners of the event. If you are interested to be one of our event partners or booth exhibitor then please e-mail us at inquire@redcloudinteractive.com. We are offering various sponsorship packages which fit your needs. Unlike other events, we are also offering you a relative advantage when it comes to online promotions. For those who are interested to join please fill out the form below. All registrations are officially CLOSED. Click HERE to see the Final list of participants . This entry was posted in Events and tagged kpop competition, kpop pilipinas. Bookmark the permalink.